The CW’s Flash was a dream come true for me. I have fond memories of being a child, sneaking into the living room after my mom passed out on the couch with the TV on, in hopes of catching the 90’s Flash show staring John Wesley Shipp. 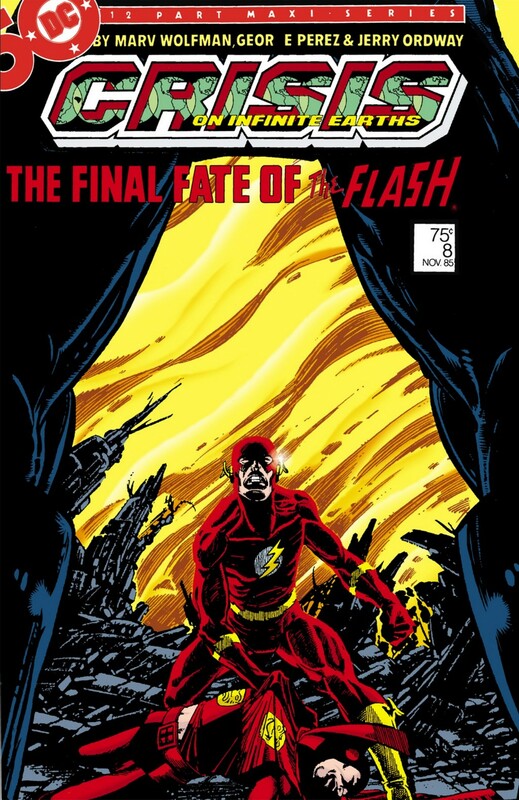 The Flash is also the one Comic book that I have faithfully bought each and every month, for as long as I can remember. I am proud to say that I am obsessed with all things Scarlett speedster! A big part of that is his rogues gallery. The Flash has one of the brightest and diverse group of villains out there, in my opinion, second only to Batman. But the most menacing of the bunch is Professor Zoom, not to be confused with the Reverse Flash. The TV show has further muddied these waters by switching names around, but that will be a write up for another day. I want to focus on the comic version of Zoom and all his terrifying glory! 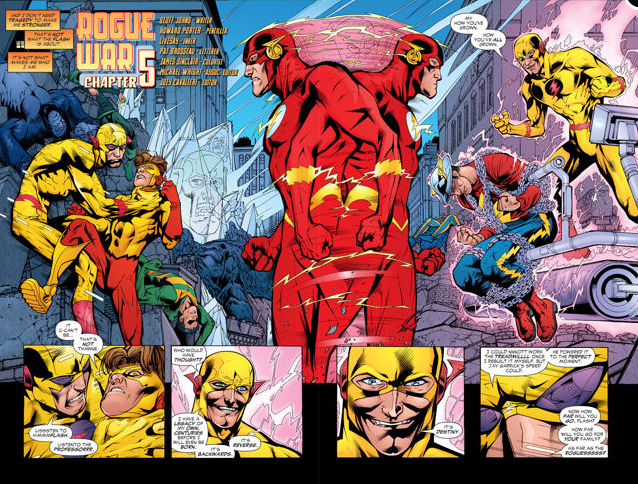 Zoom was primarily the main nemesis of Wally West Flash. 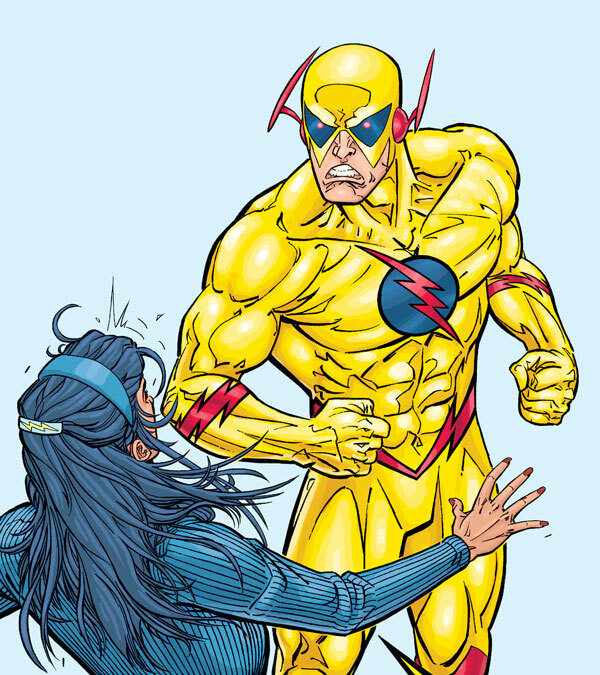 Reverse Flash was primarily Barry Allen’s Nemesis. Hunter Zolomon was a close friend of Wally West. 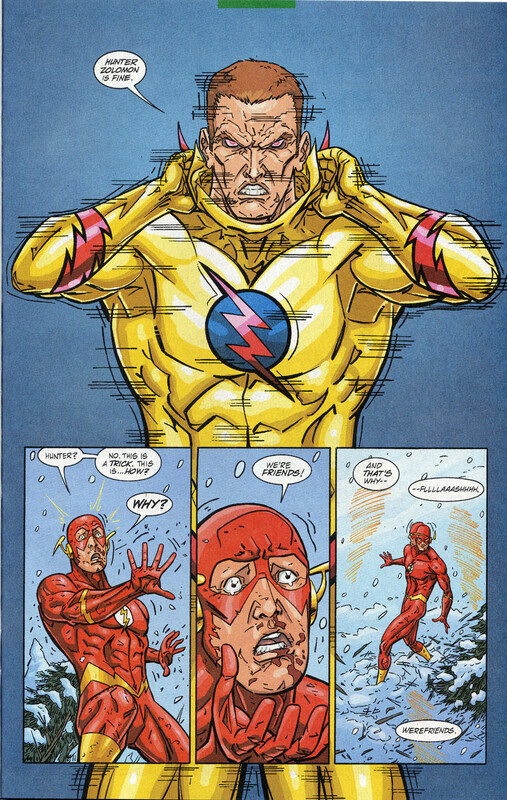 Wally is the third Flash to take up the mantle after Barry Allen died during the epic 1980’s 12 issue DC comic series Crisis on Infinite Earths. In that series Barry sacrificed himself, along with Supergirl, to save the DC universe from the Anti Monitor. 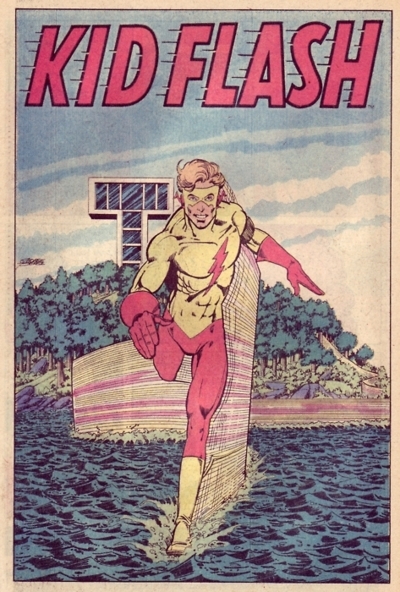 Wally, before taking the Flash mantle, was Kid Flash, Barry’s sidekick and partner. Hunter, like many comic villains and heroes had a life filled with tragedy. His father killed his mother, and also was a menacing serial killer. Hunter joined the FBI to help take down monsters like his father. After his wife left him because of an incident involving her father being killed during a shootout with super villains, Hunter’s life was in a downward spiral. Hunter was then fired from the FBI, and then moved to Keystone city, home of Wally West, the Flash. He befriended Wally after getting a job in the police department. Gorilla Grodd, another one of the Flash’s big time villains invaded Keystone City, and during the battle Hunter was left with a broken neck. Wally West decided early on to not keep a secret identity, so the world knew he was the Flash, but he still wore the mask and suit in honor of Barry Allen. Hunter begged Wally to use his powers to travel back in time, but Wally, knowing the danger of time travel, couldn’t do it in fear of screwing up the time line. So Hunter takes things into his own hands by trying to use the cosmic treadmill to do it himself. Doing so, the treadmill explodes and leaves Hunter with powers that let him alter relative time. So Zoom doesn’t truly move fast, but it appears that he is moving fast. It’s just him moving through time, and our eyes perceive it as him moving at super speeds. Zoom is an evil man, a whole different breed of evil. His ultimate goal was never to kill Wally West (The Flash of the time). Unlike Barry Allen, Wally never had any personal tragedy that helped transform him into a hero. So Hunter (Zoom) decided that it would be his job to torment Wally by taking loved ones away from him, and killing anyone he loved. He believed this would transform him into a better hero, therefore he would be responsible for the Flash being a hero. Pretty twisted, right? The current Flash TV series is having a field day with mixing up the comic history. We recently learned that Jay Garrick (The first flash from the golden age of comics) who is from Earth 2, has a doppelganger on our Earth named Hunter Zolomon. So the show explains this by saying Jay’s real name is Hunter Zolomon, he was just adopted and had a name change as a child on his earth. That’s a pretty big and interesting twist on the mythology. So who knows where the show will take Zoom. I’m going to bet that it is either our Jay, or his doppelganger Hunter Zolomon. I hope this sheds a little big of light on the DC Comics version of Professor Zoom….. I can’t wait to see what the CW series chooses to do with the iconic character! zoom will be played by rick cosnett. earth 1 zolomans adopted jays e1 dopple. The Zolomans on E2 will adopted Eddies dopple. He will be Hunter Zolomon on Earth 2. So Zoom will be Eddies Dopple. Rick Cosnett “Eddie” has recently been in Vancouver BC Filming, he has pictures posted on his instagram. Also, Candice and Wally let is slip on her Parascope that Eddie was at a table script read for episodes 16 – 19. The guy that has been in the Zoom suit has ONLY been a Stunt man. So, comparing those pictures are pointless. With all due respect, i stopped reading your post, I just want to be suprised when i watch the show, know what i mean? I am the same way with my weekly and monthly comics. I don’t read previews, or look at whats coming out this week. I like to walk into the shop and look at the shelf in wonder, like i did when i was a kid. I do the same with my tv shows and movies, i like to be surprised each week! Thanks for the comment tho i hope you enjoyed my article, and all of our pieces here at RiceBalls! Track Diesel was discussing what happens more in the comic rather than the show. Then comparing it to the television series. So its not pointless just a fun fan theory. But, thats exciting to hear whats going to happen in the actual show. Im ready to see what they do with Wally West. Glad to see so much flash love happening. I look forward to watching it.